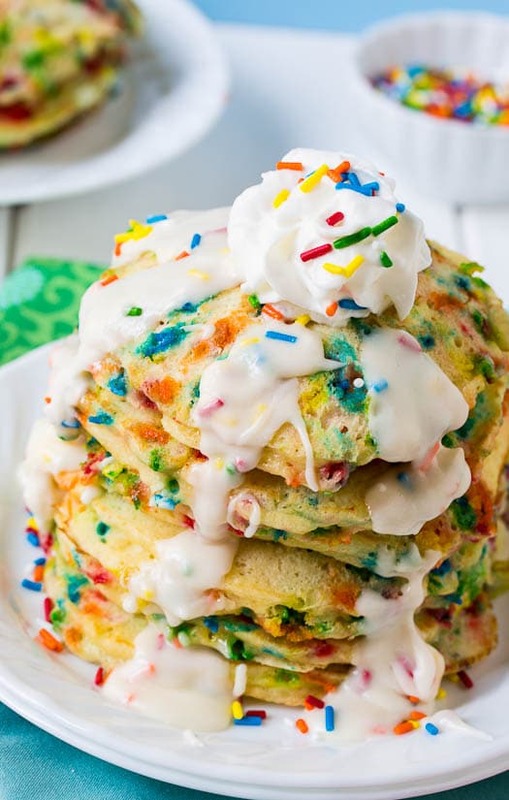 Cake Batter Pancakes with tons of sprinkles and a deliciously sweet and creamy glaze are the perfect way to start a special day. They taste just like cake, only in the form of pancakes. And who doesn’t like to get their day started with cake? When I shared the Peanut Butter Cup Pancakes I made for my daughter’s birthday breakfast a few weeks ago, I realized I hadn’t posted the recipe for Cake Batter Pancakes that started the tradition of special celebratory pancakes for breakfast on birthdays. Really, just for my daughter’s birthday. She’s the only one who gets birthday pancakes. But that’s because she’s the only one who asks for them. And the funny thing is, she probably likes pancakes least out of all of us. Go figure. 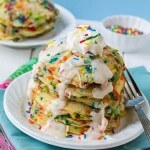 Birthday Pancakes are a really neat tradition to start.. And these Cake Batter Pancakes are just the recipe for beginning a new breakfast tradition. They taste just like cake only with the texture and form of pancakes. 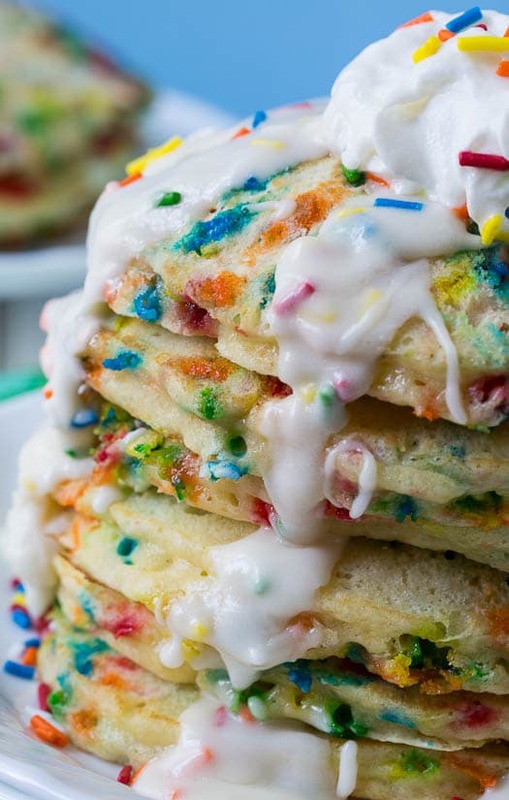 It’s a pretty basic pancake batter with one cup of yellow cake mix and a whole bunch of sprinkles added to the batter. 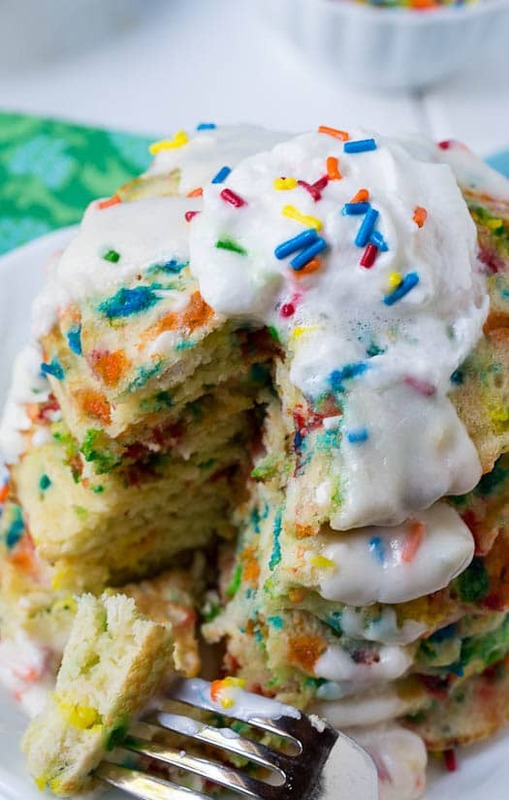 Be sure to put the sprinkles in the batter just before cooking. Any earlier and the liquid in the batter starts to make the color bleed out of them and it doesn’t take long for all the colors to get mixed together with the yellow of the batter and form an unappetizing green color. Those might be better for Halloween! The best part by far is the creamy, sweet glaze dripping down the sides. Heaven! Cake Mix Pancakes taste just like cake only in the form of pancakes. Covered with a sweet, creamy glaze they are the perfect way to start a birthday celebration. Mix flour, cake mix, sugar, baking powder, and salt in a large bowl. In a medium bowl, beat 2 eggs and add in 1 teaspoon vanilla extract and milk. Add wet ingredients into dry and mix until flour is no longer visible. If batter is too thick for your liking, add a little more milk. Heat griddle over medium heat. Coat with cooking spray. Add sprinkles to batter and drop 1/4 cup at a time onto griddle. Cook until bubbles form and flip over. Continue to cook until bottom is lightly browned. Note: Don't add sprinkles to batter until just before cooking. The color will start to bleed into the batter. For vanilla glaze, combine powdered sugar, 1 tablespoon milk, and 2 tablespoons melted butter in a medium bowl. Mix until smooth. Add heavy cream until you reach desired consistency. Add a few sprinkles. Top pancakes with glaze and whipped cream (optional). This entry was posted in Breakfast and tagged cake batter, pancakes. Bookmark the permalink. I saw these and fell in love with them. The photos are amazing. My 27 year old daughter will be home this weekend and I’m making them “just because”. They are certainly a happy stack, aren’t they? Thanks so much for the uplifting idea and photos. What a special treat for your daughter. Hope y’all enjoy a special weekend together! Wow, this is one great way to start your birthday off. I can just imagine how yummy this must be. This is one eye-popping stack of pancakes right here! What a fun tradition having birthday pancakes…who needs a layer cake with these around? These look so fun and delicious! Oh boy! If I could served this in the morning, I would feel like all my Christmases had come at once. They look INCREDIBLE! Oh my goodness, it’s like my birthday came early this year! 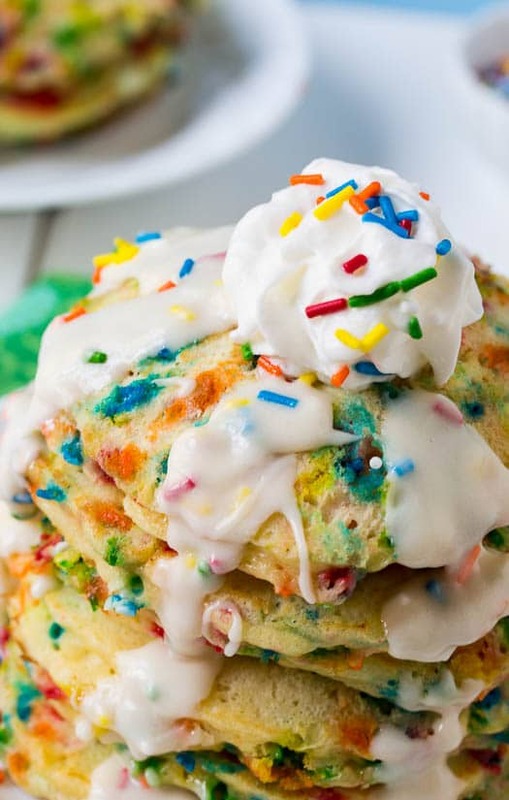 I would totally dig into these yummy, pretty pancakes!! These are adorable Christin! It would be hard for me to eat them ~ they are so cute and colorful. But, that creamy, sweet glaze makes me want to grab a fork and dig right in! What a fun child’s breakfast. Something different for a very very special occasion instead of Mickey Mouse pancakes or chocolate chip pancakes. Sprinkles just do it for me, it automatically tastes better, and it relieves the stress. Now why can’t we go back and time so I can have these for my birthday? How fun! Treat yourself n have them!